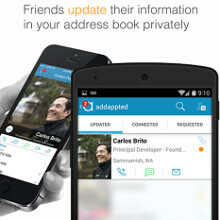 Addappt has been touted as the "up-to-date address book maintained by your friends" on iOS for a while now, and it is finally available to Android users, too. The kicker is that your address book updates in real time as soon as your friends, family or general acquaintances update their info. That's right, you don't have to bother maintaining the database anymore, just share the Addappt spirit amongst them. To do so, you need to send invitations to your phone contacts to share their info via the application, save for those that are already using it, and you will have an address book that is always up to date in no time, without lifting a finger to notify your friends when you move, for example. They update their contact information in your address book privately and similarly, you in theirs. The app also allows you to create groups by family last name, company name, college name or even city with a few taps, and call or text straight from the search results. Unfortunately, the ability to email, text or send photos via email to groups privately has remained iOS-only, but hopefully it will wiggle its way in the Android version as well. we need to send invites? okay nevermind then dont think ill download it, people don't like responding to invites like this kind. Agreed. This service is essentially Plaxo reborn on a mobile platform, only more restrictive. Free = you and your friends are the product. Yet another data stealing ream job from Silicon Valley types. No thanks. this app seems to be a far-inferior copy of 6degrees, the contacts app that lets you update your contact on all your friends' phones just by updating your own phone. In addition, 6degrees also lets you delete duplicate contacts, broadcast messages to all your contacts, and has a superb people-finder feature where you can find friends and request intros. Addappt seems to be completely featureless and a rip-off.